Women’s access to reproductive health care, including abortion, this week has again become a key domino in the game to be played out at the US Supreme Court. Unfortunately, the health and well-being of women in Louisiana and other states hang in the balance, as does the rule of law and how precedents are applied in our judicial system. This case isn’t new, nor is the strategy of chipping away at the ability of reproductive health clinics to provide abortion services to clients. In fact, the issue it brings to the fore—the mandate that doctors at abortion clinics have admitting privileges at hospitals within 30 miles of their clinics—may cause déjà vu. What’s wrong with this picture? Well, the Supreme Court already ruled on this issue in a Texas case, Whole Women’s Health v. Hellerstedt. 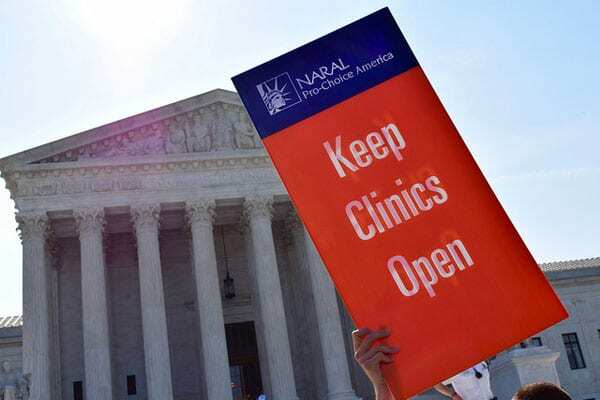 In a 5-to-3 decision in 2016, the Court ruled that this same “admitting privilege,” along with a requirement that these clinics meet the same standards as surgery centers, placed an undue burden on women seeking reproductive care and abortions. So, the question being raised again before the Court is one of precedent—has this not already been decided? Is an undue burden different in Texas than Louisiana? Are lower federal courts disregarding Supreme Court decisions? All of this is at play this week when the Court considers how it will rule. The consequences of a 5–4 decision permitting Act 620 to take effect would extend far beyond one state. It would indicate that the Supreme Court’s new majority has retreated from Whole Woman’s Health, signaling that states are free to ignore it and pass stringent laws targeting abortion clinics. Once Whole Woman’s Health is functionally overturned, Roe itself will be next on the chopping block. After all, Whole Woman’s Health really just reaffirmed the fundamental principle that states may not devise pretextual excuses to deny women control over their reproductive rights. Once that rule is scrapped, states will be unleashed to regulate abortion out of existence within their borders. Even if this ruling does uphold Whole Woman’s Health and gives abortion supporters something to cheer about, it won’t be for long. This Louisiana case is one of 13 state cases that have reached the federal court of appeals. The next step in appeal is the Supreme Court, and it is doubtful that all 12 of these other cases will be held off. Within the next year or two, one or more will reach the Supreme Court and the threat to Roe v. Wade becomes more manifest, given the makeup of the Court. The ray of sunshine for reproductive rights advocates in all this comes from those states whose legislatures are passing legislation that will protect a woman’s right to an abortion even if Roe v. Wade is overturned. New York’s governor just signed the Reproductive Health Act into law. Other states, such as New Jersey, California, Illinois, and Maryland are some of the states that legislatively or through their state constitutions protect a woman’s right to abortion.